In late April 2015, The Washington Post published an article about then-recent poll numbers showing that 13% of Americans (and 21% of self-identified Republicans) supported a unilateral, unprovoked, wholly illegal military attack on Iran. The report's author Aaron Blake at one point referred to what he described as "Iran's nuclear weapons program," despite the fact that Iran does not currently have - nor has it ever had - such a program. Well, The Washington Post is at it again. In its coverage of a new blockbuster New York Times Magazine profile of Ben Rhodes, Obama's deputy national security adviser for strategic communications, the Post's media columnist Paul Farhi recycles the very same error his colleague did a year ago. In describing the Obama administration's efforts to garner support for diplomacy with Iran and to build Congressional support for the Joint Comprehensive Plan of Action (JCPOA) signed in July 2015, otherwise known as the Iran Deal, Farhi notes that "Rhodes’s boss, President Obama, has been a strong and consistent advocate for the agreement with Iran, which requires the country to stop its nuclear weapons program in exchange for the lifting of economic sanctions." 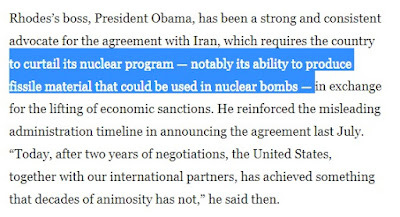 As I've noted before - and, unfortunately, ad nauseam - Iran does not have a nuclear weapons program. Indeed, long before the recent negotiations that led to the signing of the JCPOA, international intelligence agencies and the organization empowered to ensure compliance with nuclear safeguards had affirmed that Iran was not weaponizing its nuclear energy program. In fact, Iran's nuclear program, which is regularly monitored and protected by treaty, has never been found to have had any military dimensions of any kind. Nevertheless, against all facts, the pernicious narrative of Iran's relentless pursuit of atomic bombs persists. Repeating falsehoods has dangerous consequences. It is incumbent on reporters like Farhi to get the story straight.
.@Farhip claims JCPOA halted Iran's "nuclear weapons program," something no intel agency on earth said it had. He should issue a correction. May 7, 2016 - Apparently Farhi got the message. The correction is in the text of the piece only; no additional note identifying the initial error has been appended to the article. For reference, the original article - as first published - can be found here.